Claims for unemployment benefits begin with the employee, who is called the claimant, filing a claim for unemployment benefits, or what is commonly called unemployment compensation. Our attorneys recognize the common mistakes claimants make at this stage. Employers can and do use the information claimants provide in their application for benefits during unemployment hearings against the claimant. Employers’ written responses, generally called a protest, or the employer’s verbal response to questions asked by the state before a deputy’s determination is rendered can also be used against the employer. Once an application for benefits is filed, the state unemployment agency will notify the employer of the claim for benefits and the employer will have the opportunity to respond. Claimants are emotionally vested and often file too much information other than what is required to be awarded benefits. Employers who use third party representatives or cost control firms often find that those firms do not filter the information provided to them for forwarding to the state for their consideration and often jeopardize the employers case. The initial decision regarding the award of unemployment benefits in most states is called a deputy’s determination. Either the claimant or employer can appeal the deputy’s determination. The two most common deputy determinations are based on intentional misconduct and a quit. Employers and claimants need to find the appeal within the time specified on the initial determination. At the Law Office of Kenneth P. Carp, we find that both parties provide an abundance of evidence that can be used against themselves when they file an appeal. Too much information and the wrong information are often provided. After the appeal is filed, an appeal hearing is held. Although state unemployment offices stress that an attorney is not needed, both employers and claimants benefit from the experience of the Law Office of Kenneth P. Carp, where our attorneys know unemployment law and the rules of evidence applied by the hearing officers and judges that make the final decision. Although the hearings appear to be informal, our hearing representatives know what evidence the judge is looking for. Also, the only evidence that can be used in legal proceedings after the appeal hearing is limited to the evidence introduced during the appeal hearing. 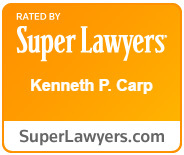 The law office of Kenneth Carp can help you with all aspects of the claim process. Contact attorney Kenneth Carp at 636-947-3600 or through kennethcarp@kcarplaw.com and learn how the Law Office of Kenneth P. Carp can represent your interests during the unemployment claim process.